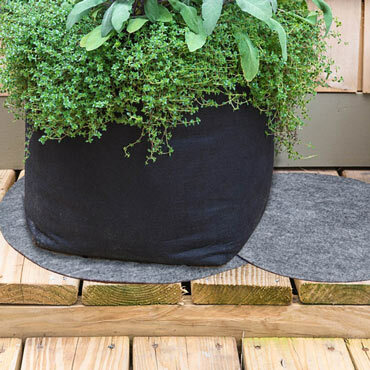 These lightweight, foldable mats are specially designed to fit under our exclusive Grow Tubs® to provide discreet protection to keep from spreading excess water over decks and patios. Each mat is made of a water-retaining material that helps protect your deck or patio from water stains, while the charcoal-colored mats blend perfectly with your Grow Tubs. They're both machine washable and stain resistant, and should be hang dried after cleaning. For your 7 and 10 gallon tubs, select the 20" round mats. For your 15 and 20 gallon Grow Tubs, choose the 28" mats. A must-have for gardeners who enjoy our Grow Tubs!